Group 180’s recordings are shockingly fresh, as vibrant and necessary now as they were thirty years ago. Even more so, really; there is an emotional thrust, a crackling energy, that’s as rare today as has ever been in modern classical. Their recordings explode with a hive-mind dynamic, a multi-headed beast whose limbs move in flawless concert, ebbing and flowing with a natural feel more akin to a rock band or a jazz quartet than a classical ensemble. The emotional power of their music is timeless. Minimalism persists in our musical consciousness because of its remarkable duality: futuristic yet atavistic, simple but complex, always moving while forever static. The way themes and events play out over patterns and repetition makes one think of a congregation led by a shaman, or a preacher… despite being relatively new, minimalism feels like something ancient, something that’s been just outside our periphery for thousands of years, waiting to be discovered. But those same qualities create pitfalls. The peculiarly repetitive and cerebral nature of the music creates great potential for minimalism to sound cold and inorganic, threatening to consume any ensemble not up to the task. Group 180’s music lasts because of their energy and empathy, likely because of their unorthodox approach. “Group 180 wasn’t simply a music ensemble. 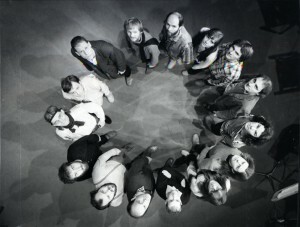 It was a community of thinking and feeling people”, says composer/multi-instrumentalist Tibor Szemzo, who co-founded the group in 1979 with László Melis. “This was Hungary, this was the Iron Curtain. This was a bunch of people in their early 20’s, feeling similarly, defining themselves against. You had to define yourself against something.” Rebellious politics affected every aspect of Group 180’s existence. Their members came from a variety of backgrounds: jazz, classical, religious, academic… even nonprofessional musicians filled out the ranks. “It was more of a personal quality, a human quality, than being a good instrumentalist. The affinity was a lot more important for us, the relation to each other.” Group 180 would often rehearse three or four times a week, then spend the rest of their time at the pub, or at each others’ homes. “We behaved as a family” he says. “We called each other ten times, a dozen times a day.” Their tastes ranged far and wide, from pop music to Ravi Shankar, but minimalism served as the uniting force. Szemzo first encountered minimalism when he heard Steve Reich’s “Clapping Music” in Warsaw in the early 70’s. Soon after that, Szemzo and Melis were devouring what few scores they could acquire through the New Music Studio, a group of older composers based in Budapest. Szemzo had always been interested in pushing musical boundaries; his pre-Group 180 quartet were equally adept at jazz-influenced improvisation and Bach chorales. 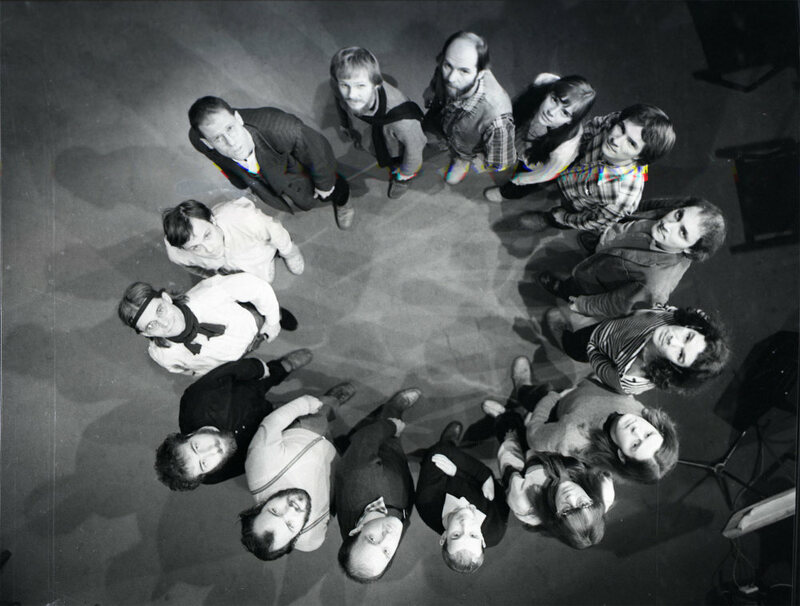 When Group 180 formed, their early programs were as likely to include Stravinsky as they were Rzewski (whose Coming Together Szemzo calls “the most influential” piece for the group). From the beginning, Group 180 worked with artists from a variety of media, including writers, filmmakers, and performance artists… many of whom had been blacklisted by the government. Their fearless, unprecedented style resonated with far more than just fans of cutting-edge art music: Szemzo uses the phrase “unexpectedly popular” to describe Group 180’s sudden ascent. Within a remarkably short period of time, their audiences swelled to hundreds, even thousands of people, a meteoric rise more associated with pop acts than chamber groups. While they were never directly censored by the government, Group 180 ran afoul of the authorities in other ways. Every time they traveled, even when invited to major festivals, the agents in charge of travel and passports would lay an exorbitant tax on the group’s earnings. Despite this, Group 180’s success went far beyond Hungary. Critics and audiences in the West who were used to relatively tame, hyper-professional concerts had never seen anything like Group 180’s commune-esque closeness or the raw, unvarnished performances that closeness produced. The combination of art music style and pop music energy proved to be irresistible, and Group 180’s global following flowered. Two albums remain widely available: their self-titled 1983 release, and its 1985 follow-up, simply titled II. “Required listening” doesn’t begin to cover it… these records carry a weight, a heft of importance and vitality that stretches across and beyond the decades since their recording. Rzewski’s Coming Together and Attica unfold in an ever-expanding procession, like an Escher painting of a flower blooming in an infinite loop. Three Reich pieces appear: Piano Phase, Music for Pieces of Wood, and Octet. The emotional connection between Reich’s work and the members of Group 180 is palpable, plowing through hypnotic waves of rhythm with downright danceable grooves. But the real meat of these records is in the original pieces written by ensemble members: Szemzo’s Water-Wonder, László Melis’ Etude for Three Mirrors, Béla Faragó’s A pók halála, and András Soós’ Duett. These pieces vary wildly in tone and color. Some are mournful, some are joyous, some sections sit firmly in the minimalist style, some defy easy categorization, but all of them are wildly original. These compositions are statements, the battle cries of musicians fighting against a conservative musical establishment and an oppressive government, of composers struggling for recognition. A Hungarian school of minimalism didn’t exist beforehand (Hungarian musical education at the time essentially began and ended with Bartók and Kodály). After Group 180, nobody could deny the importance of these compositions, and their authors, to the world of music. Group 180 dissolved for a variety of reasons: money, creative differences, the change in priorities that comes with age. Szemzo attempted to reinvent the group as a sort of workshop, opening the ranks to new members and encouraging compositional contributions from everyone, but the magic was gone, the energy had changed. “This was a creation of the times, of a given situation,” he says. For a project as dependent on interpersonal dynamics as Group 180, the change proved to be insurmountable. But their impact was undeniable, lasting through today and into the future.